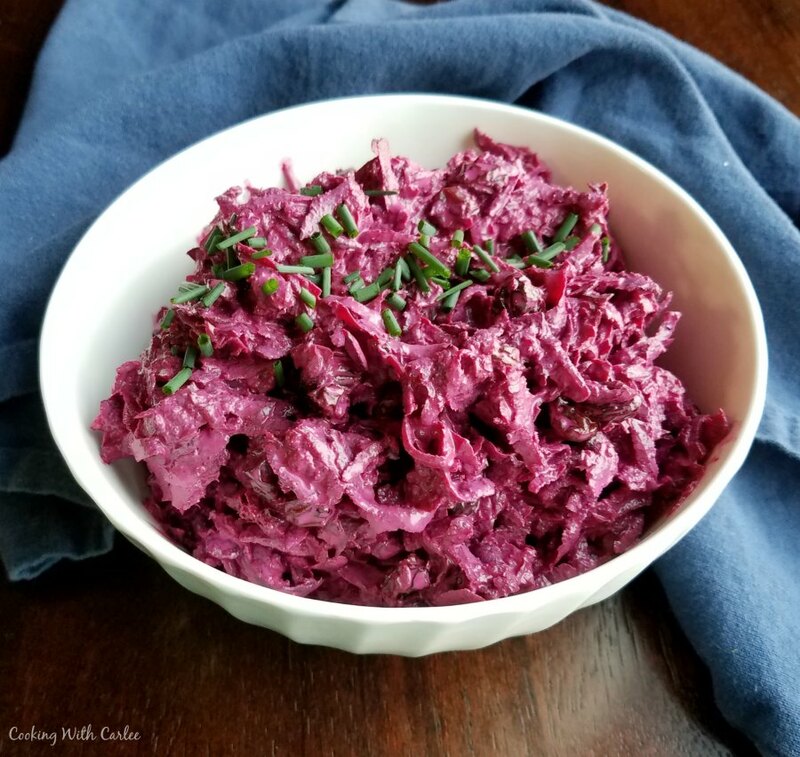 Russian Style Beet Salad is the perfect combination of creamy and crunchy, savory and sweet. You just have to try it! 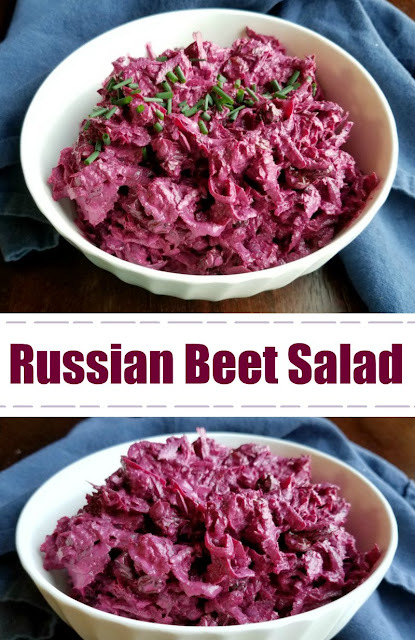 Don't let the color scare you off, this simple Russian style beet salad is delicious! It is a great sweet and savory combination as well as creamy and crunchy. It has it all! It seems like beets are one of those foods you either love or hate. My husband comes down on the hate side, I am a lover. Oddly enough though, he enjoys the greens. So he dutifully plants them in our garden each year knowing I'll either make a salad or wilt the greens into dinner for him the same night I make the beet roots for me. Each year he takes a bite of beet to confirm he still doesn't care for them and each year the answer is the same. So I eat them all myself and I'm fine with that! I usually either roast or boil them and eat them pretty much as is. Though I do love them on a salad too. The persimmon and beet salad with goat cheese was 👌. When our most recent CSA box came with beets, I figured I had better come up with some different preparations. Our healthy sized row in the garden is ready for harvesting as well. That means I have a lot of beets to eat. All. By. Myself! After some poking around, the sour cream dressed Russian beet salads caught my eye. But most of them called for boiling the beets until soft and then grating them. While I'm sure they are great that way, it's hot and we're busy. I figured if they were grated finely, the boiling could be skipped. My air conditioner thanked me for that decision! Plus the thought of grating a soft beet didn't particularly appeal to me. Beets are a bit messy anyway and grating them cooked seemed like it was asking to make the kitchen look like a crime scene. Had I used the food processor, this salad could have been made in a few minutes. Instead Little Dude and I took turns on the box grater. He loves that job and don't worry, I take over when the pieces get small. The dressing just takes a couple of simple ingredients. The salad can be made hours ahead of time or even a day in advance. That gives it a chance to come together and the raisins soak up any extra liquid. To my surprise, there was actually a small pile on my husband's plate that night for dinner. Hr said it was edible and ate all of what he had served himself. MiMi tried some too and said the raisins really made it for her. I enjoyed it as well. The beets still had a little crunch left to them, but in a good way. Kind of like a sweeter creamy slaw. I sprinkled some leftovers with chopped pecans and it was delicious like that as well. I'd bet a nice diced crunchy apple would be good in it as well. I'd stir that in right before serving, but I'd bet it would be fine added in advance if need be. Have you ever tried a beet salad? 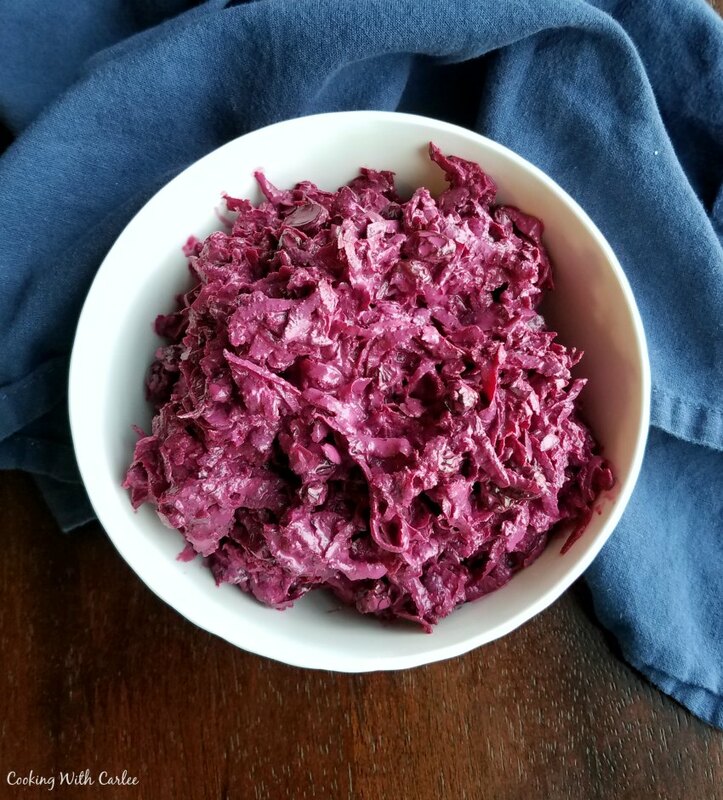 What are your favorite ways to eat beets? Wash and peel beets, then grate. I used the medium holes on our box grater. In a small mixing bowl, stir together the mayonnaise, sour cream and apple cider vinegar. Season with a pinch each of salt and pepper and the garlic powder. Stir in the beets and raisins. Cover and refrigerate until ready to serve. Stir in chopped nuts or apples if desired and garnish with fresh herbs. That is a great way to cook the beets. I am going to have to do that too! You Are killing it with these yummy and colorful salads. So perfect for Summer! It's been fun switching them up! I think everyone who tried it was surprised how much they like it! 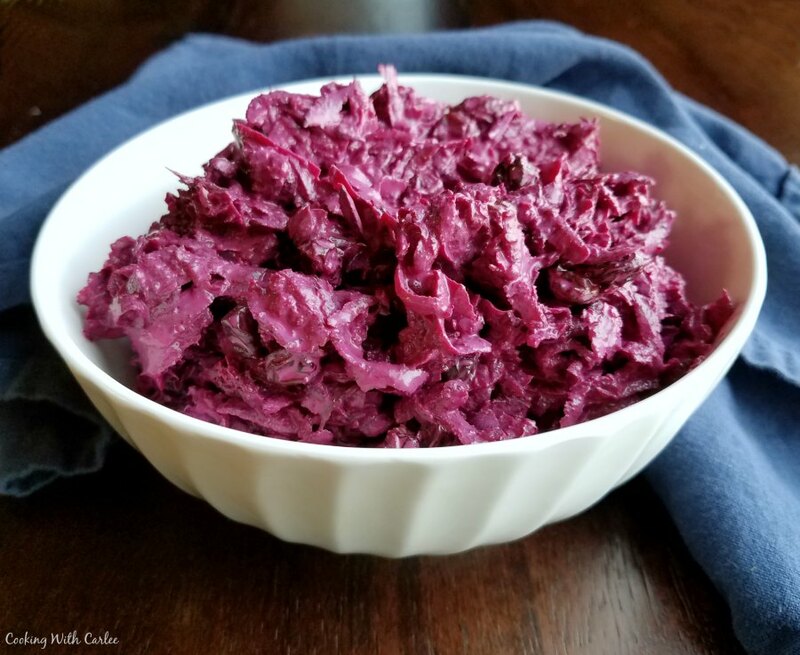 I love beets and this does sound somewhat like a slaw. I also like slaw so I definitely need to try this. Thank you for the recipe. 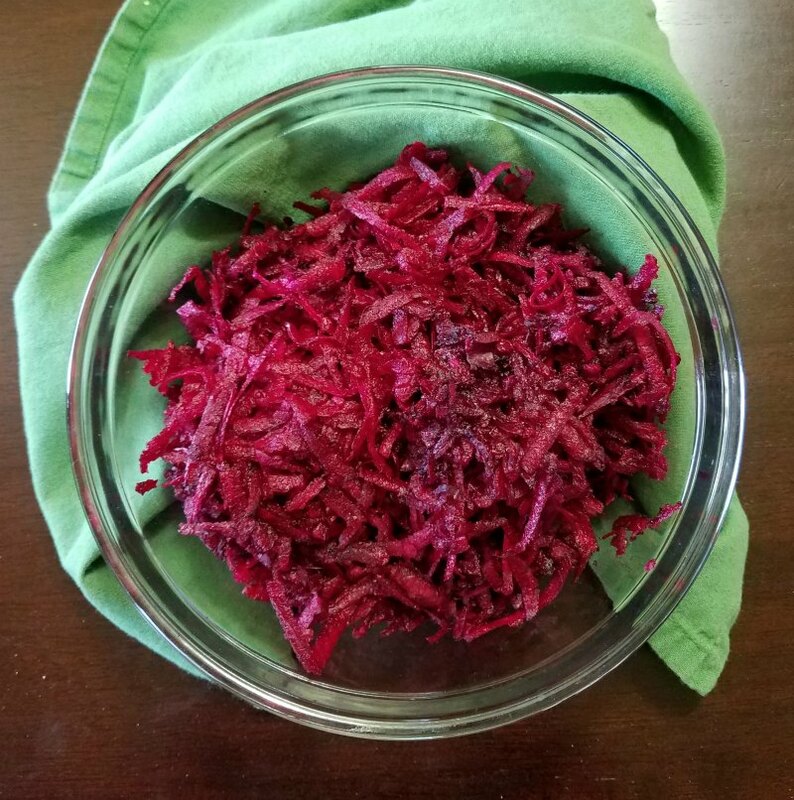 It was fun to do something different with beets, I almost always just roast them and devour them!